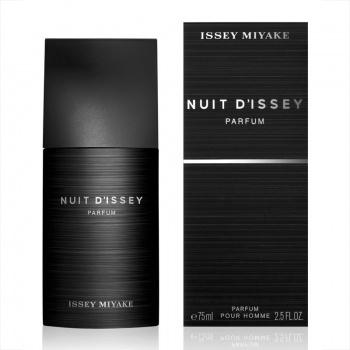 Issey Miyake Nuit d'Issey Parfum, the new contrast, it is a magnetic, mysterious and vivid composition that evokes dark night opens with accords of grapefruit and pink pepper. Leather and vanilla in the heart give an elegant touch to the composition. The rich and textured base consists of tonka bean absolute and patchouli for a distinguished and lasting essence.